Which came first, the View or the Model? As I wrote and subsequently taught the Silverlight Tour workshop, I've had a number of discussions with students, clients and the community-at-large about how to architect Silverlight applications. Model: Responsibile for managing and delivering data. ViewModel: Responsible for shaping, sorting and filtering data for a view(s). View: Responsible for formatting and displaying data. 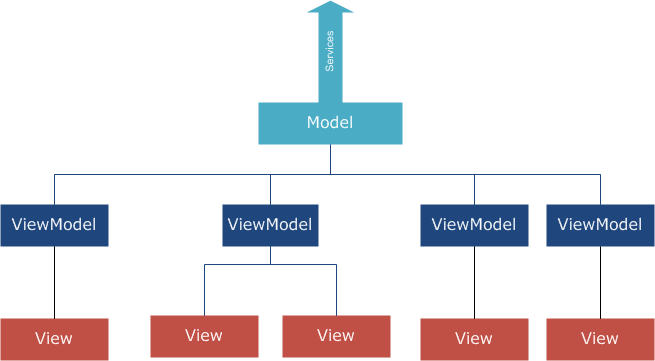 View-First: The View has a relationship to its ViewModel(usually through data binding). ViewModel-First: The ViewModel creates the view (usually through an IoC container). In both of these methods I tend not to like the sticky-ness of the view to the view-model. Also, both of these imply a one-to-one relationship which while the common case, is not the always case. I have come up with another pattern that I am tentatively calling a "Marriage". (I don't love this name but its the closest, non-technobabble name I've found for it). In my design, I want the View and the ViewModel to be ignorant of each other so that I could mock either side of the equation without impacting the other. In practice, mocking the View-Model is common, but mocking (and testing) the View is not common at all. But by not tying them tightly, it does allow us to move to a one View-Model to multiple Views without any real pain. The magic of this code is that you retain the anonymity while perserving the functionality. It becomes the user of the View/ViewModel's responsibility to determine how they are related. I explain this pattern in my article on the Prism Framework and Silverlight coming in next month's MSDN magazine. Using this pattern with an overall Composition pattern for building your applications has a number of benefits beyond separation of responsibilities and testing. Just to throw a plug in as well, I also teach this pattern (and Prism) in our Advanced Silverlight Workshop coming to Seattle in August. Let me know what you think of this versus the View-First or ViewModel-First patterns.